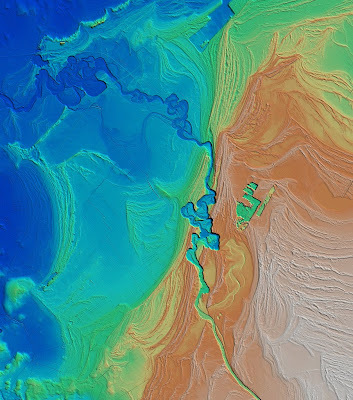 'Forced regression' is an important concept in sequence stratigraphy - it occurs when relative sea level falls and the shoreline shifts in a seaward direction, regardless of how much sediment is delivered to the sea. This is in contrast with 'normal' regressions, which take place when relative sea level doesn't change or it is rising, but rivers bring lots of sediment to the coast and are able to push the shoreline seaward. These concepts are commonly illustrated with simple cartoons (like the ones on the SEPM sequence stratigraphy website), showing how beach deposits stack in a dip direction, and how their tops are eroded by rivers as sea level continues to fall. Looking at this crystal-clear morphology, it is tempting to think that this area must look very interesting in Google Earth as well. 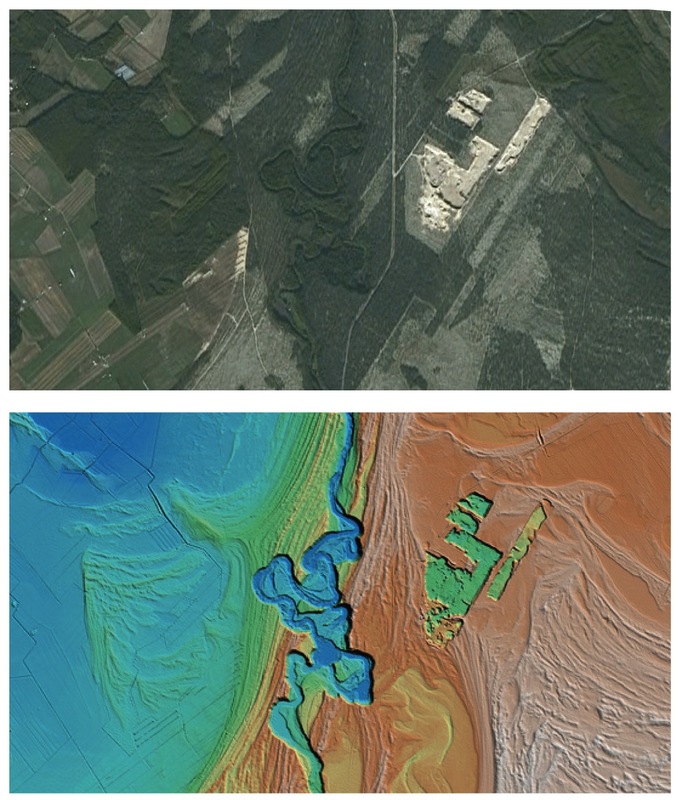 It turns out that it doesn't; this is actually a pretty heavily vegetated land, not too spectacular on conventional satellite imagery (see figure below). The laser rays of the lidar are able to see through the non-geomorphological 'noise' and show stunning geomorphological detail. To explore a higher resolution version of this image, and for additional lidar visualizations of similar beauty, check out Jouko Vanne's Flickr site. The National Land Survey of Finland has started collecting this kind of data in 2008 and they are planning to cover the whole country with high-resolution DEMs within a few years. If you make your tea the old-fashioned way, ending up with a few tea leaves at the bottom of the teacup, and you start stirring the tea, you would expect the leaves to move outward, due to the push of the centrifugal force. Instead the leaves follow a spiral trajectory toward the center the cup. The physical processes that result in this 'tea leaf paradox' are essentially the same as the ones responsible for building point bars in meandering rivers. It turns out that the first scientist to make this connection and analogy was none other than Albert Einstein. 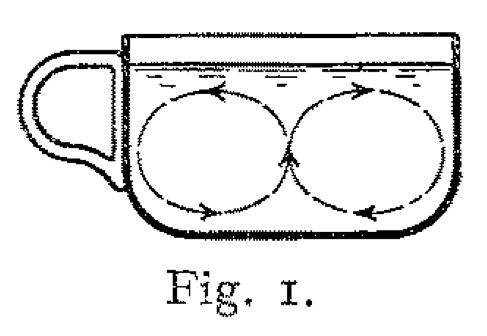 In a paper published in 1926 (English translation here), Einstein first explains how the velocity of the fluid tea flow is smaller at the bottom of the cup than higher up, due to friction at the wall. [The velocity has to decrease to zero at the wall, a constraint called 'no-slip condition' in fluid mechanics.] 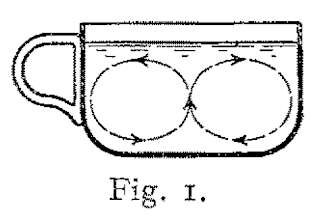 To Einstein it is obvious that "the result of this will be a circular movement of the liquid" in the vertical plane, with the liquid moving toward the center at the bottom of the cup and outward at the surface (see the figure below). For us, it is probably useful to think things out in a bit more detail. Einstein goes on to suggest that the "same sort of thing happens with a curving stream". He also points out that, even if the river is straight, the strength of the Coriolis force resulting from the rotation of the Earth will be different at the bottom and at the surface, and this induces a helical flow pattern similar to that observed in meandering rivers. [This force and its effects on sedimentation and erosion are much smaller than the 'normal' helical flow in rivers.] In addition, the largest velocities will develop toward the outer bank of the river, where "erosion is necessarily stronger" than on the inner bank. I find the tea-leaf analogy an excellent way to explain the development of river meanders and point bars; just like tea leaves gather in the middle of the cup, sand grains are most likely to be left behind on the inner bank of a river bend. Yet Einstein's paper is usually not mentioned in papers discussing river meandering -- an interesting omission since a reference to Einstein always lends more weight and importance to one's paper (or blog post). That explains the 'beer' part of the title. And it is time to have one.